The driver — or #1 wood — features the longest shaft, biggest head and least loft (aside from the putter) of all golf clubs. It’s designed to hit the ball long distances from the tee, usually on par-4 and par-5 holes requiring multiple shots to reach the green. The standard driver for male golfers features a shaft of 43-47 inches, a head size of 380-460cc, and a loft between 7-12°. Modern driver heads may be made from a variety of materials, including titanium, steel, graphite or a combination of different materials. Graphite composites are the most popular shaft choice. Many golfers focus intently on the distance they hit the driver, as longer drives lead to shorter approach shots. While a small percentage of amateurs drive the ball more than 250 yards, professionals routinely hit drives in excess of 300 yards. Because of its dimensions, the golf driver is considered the most difficult club to hit with accuracy. It’s typically the most expensive club as well. 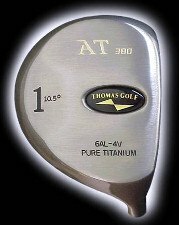 Thomas Golf (www.thomasgolf.com) makes a range of custom-fit drivers.